As part of our commitment to you, nos chers clients, who love walking in France, we have selected what we consider to be the best and most appropriate accommodation options for each of our walking tours. Subject to availability, this comprises a dynamic mix of hotels, auberges, chambres d’hotes [guest house and ‘tables d’hotes’ if dinner is included], walkers’ inn and the very occasional refuge in middle mountain locations. In each case you always stay in a private room, never a dormitory, and our selection process is based on availability, comfort, convenience, facilities, location, service and welcome. Rest assured that in each case we have visited the premises, met the owners and staff and, in many cases, even stayed there ourselves. Hiking in France is one of life’s great pleasures so long as uninviting and unwelcoming accommodation isn’t part of the bargain. Happily, that is something you will not experience when walking in France with The Enlightened Traveller – although we may have done so ourselves as part of our selection process! The vast array of French accommodation offers can be incredibly confusing – how do you choose between a 2-star hotel, a 3-star bastide or mas or a 4-star chambres d’hotes or residence? Do two stars mean a better rating than the equivalent number of ‘ears of corn’ (used by Gites de France), ‘keys’ (Clevacances) or ‘fireplaces’ (used by the Logis marketing group)? And what happens when the same place is given a 2-star hotel rating but only one fireplace? In France, a rating is generally re-assessed once every five years, when our experience tells us that ownership can change hands three times in that period. We know of cases where the Office de Tourisme charges to promote chambres d’hotes that they have never visited. Small wonder that many accommodation providers prefer to remain outside of the ‘official rating system’ whilst fulfilling the fundamental norms of hygiene and safety without which they could not trade. 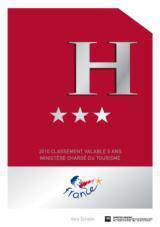 When walking in France you will notice that hotels are now classified into five categories from 1 to 5 star. The new system, introduced in 2012, saw the disappearance of the sixth, ‘0 stars, limited comfort’ category and the introduction of a 5-star level replacing the former 4 stars de-luxe rating. Unsurprisingly, the reform has already been criticised as having as its main objective the creation of a ‘fifth star’ in France, with little interest in reforms at the lower end. The previous classification system, was said to correspondent to ‘norms of comfort’, whilst not constituting a label of quality. In other words, a pretty meaningless system that was at best a guide and at worst an opportunity for complacency. After decades of underinvestment, it was obvious that the gulf between start ratings and reality had to be addressed. If the authorities devised a real and objective quality system, those deemed to be ‘low quality’ would never have gotten business and in turn sued the authorities. As anyone who has studied and implemented quality systems will tell you (and the author of this text has successfully gained ISO 9001 classification for an organisation after training), it’s a question of establishing your own quality norms and systems and then meeting them. Nothing objective there, then. Hiking in France has taught us that arranging the best accommodation for our walking tours in France depends on the right blend of material features and service, and the latter is down to people – people and staff that you have never met. Note also that the criteria for designation, developed in the 1980s, was a voluntary one, and referred principally to the number and dimension of the rooms, the availability of bathrooms and general services, like breakfast. This stigmatized the smaller, family-run hotels that hikers generally preferred to stay in. Thus those ‘hotels’ with fewer than five bedrooms could not [and still cannot] obtain official starred hotel status. By way of example, there is not a single chain hotel in the department of Lozere, France’s most remote department, which boasts some fine hiking trails including the Regordane Way and the Stevenson Trail. Who would want to run a big hotel in the middle of nowhere, that was empty out of season? Surely a smaller hotel is more attuned to the demands of modern business and eco-tourism? Finally here, and quite significantly, it costs money and resources (bureaucracy) to have a rating for your hotel in France. Some owners of very nice accommodation simply cannot see the justification for it and so refuse to pay it. And if they are providing an excellent product, and getting repeat business from satisfied clients, why should they bother with an official star rating? Many do not. Here are a couple of experiences with hoteliers under the previous system. The first one had spent enormous sums bringing the hotel up to ‘3-star standard.’ However, as ‘3-star’ hotels needed to have a lift/elevator and a restaurant, the maximum rating available from the state would have been 1-star – an insult to their image in the eyes of the owner, whose character accommodation could not be violated in order to install a lift and who saw no need to run a restaurant when there were three or four in the same street! The second was a case where the ‘authorities’ were happy to allocate an upgrade from 1 to 2-star subject to one of the ground-floor rooms undergoing expensive alterations to enable disabled access. An inn has been on the site in question since the middle ages, is in ‘the middle of nowhere’ and only really used and much-loved by the hiking fraternity. Yet remember: all hotels must comply with French health and safety and fire regulations if they are to do business. So the moral is: unclassified does not equate to poor accommodation and, in some cases, equates to much-sought-after walkers’ inns. All accommodation offered to those walking in France with The Enlightened Traveller has been carefully-selected and offers an authentic French experience. With the exception of large towns, where the only viable options are generally chain hotels, our preference is to place you in family-owned and run establishments run by people who care as much about their businesses as we do about ours. They all come with our own personal recommendation. Wherever you stay, you are assured of a warm welcome, in the most appealing surroundings in the area, and with most ‘mod cons’ and a few more traditional ones thrown in at no extra charge. Hiking in France leads to many a discovery and accommodation is no exception. One of the nicest accommodations we know has a 2-star rating. The proprietor was offered a third star under the old system if he employed someone else who spoke a ‘third’ language. He declined, as the costs of employing people in France would have meant putting up his prices, something which may have adversely affected his regular clientele. Interestingly enough, the requirement for a third language has been dropped under the new classification system, a clear dropping of standards. Pictures don’t tell the full story and neither do hotel owners. We can all find some accommodation on the internet that looks and sounds okay, but you never know what it is really like until you have visited it or stayed there; and then it can be too late – your holiday or special occasion ruined due to poor service, uncomfortable rooms, unfriendly staff or an inadequate location. And it may be a surprise to you, but some hoteliers do not want hikers staying with them! You can imagine how uninviting that experience can be, when you turn up at the end of the day with your backpack to find someone at the reception more interested in checking the mud levels on your boots than making you feel welcome! As one of our clients walking in France, we aim to introduce you to as diverse a range of cultural and geographical settings as is possible within the parameters of any particular tour programme. Hiking in France is also about enjoying French cuisine and it is unlikely that you will lose weight on one of our walking holidays in France. That said, our policy is only to include essential meals with your tour and leave you free to choose where to eat lunch [and occasionally diner] if options are available. Often they are not. As always, and subject to availability, our commitment to customers is to offer the best accommodation in every stage along our trails. Accommodation has been carefully selected on the basis of a dynamic mix of superior cuisine, facilities, location, service and welcome. We cannot create options where they do not exist, and ultimately each hotel is a business in its own right, but our close and regular contact with providers means they are kept very much up to date with the latest feedback from our savvy customers; and these same customer evaluations assist us in modifying the accommodation mix on an ongoing basis. Ultimately, if there is an alternative to where you are staying, we know about it and have consciously chosen not to place you there, irrespective of the opinions of others hikers you chat to en route – rely on us! • A team sensitive to sustainable development. Hotels are rated against a list of 240 factors that includes equipment. How these norms, and the proper functioning of equipment, is to be checked by an outside agency that only visits once every five years is unclear. Moreover, whilst not directly relevant to walkers, the much-heralded commitment to making all hotels accessible to disabled customers [at least one room in a hotel, or no star status would be awarded] has been quietly dropped. 1 star: previously referred to as offering basic comforts, this has now been re-labelled as ‘budget accommodation’. The only other stipulation is a minimum room size excluding bathrooms, which can either be inside or outside the room in question. It is not clear whether this includes facilities in the corridor, on the next floor or so on. 2 and 3 star: formerly classified as being ‘comfortable’ or offering a ‘high level of comfort’ for 2 or 3-star offers respectively, they are now placed together in a common category corresponding to middle-of-the-range or mid-market [“au milieu de gamme”]. At least one member of staff must speak a European language other than French, which is a lowering of standards from the previous norms; and if you do not speak either French or, say, Polish [were a Polish family to purchase a hotel in France, for example], then English would not necessarily suffice. The reception must also be manned for ten hours a day. i. room size: the minimum 3-star room size must be 4.5 m² larger than the minimum sized 2-star room of 9 m² – although the stated 2-star minimum room size need not include a bathroom, whilst the 3-star minimum room size must include a bathroom. This would appear to allow spacious 2-star hotels an easy route to becoming 3-star, whilst enabling spacially-challenged 3-star hotels to retain 3-star status. ii. internet access in a common area needs to be guaranteed at 3-star level, but not at 2-star – vive le progres! Whilst not particularly relevant to hiking tours [although feel free to ask us to upgrade you to 4-star accommodation in major cities! ], the former 4-star [very high level of comfort] and 4-star de-luxe [up market] has now been replaced by new 4-star [up market] and 5-star [very up market] offers, respectively. This would tend to indicate a general upgrading of the relevant offers in France, on paper at least. The new five star signage is in a colour of its own. Finally here, a couple of observations based on real cases should help to demonstrate that the new system has not made hotel choice any easier. We worked with a French-family-run, two-star hotel in a Roman Provençal city that was recently sold to an Anglo-French couple. This hotel had consistently received the highest TripAdvisor ratings in the City over a prolonged period, but was beginning to look a bit tired inside. What the couple lacked in finishings was more than compensated for by the service and welcome. The new owners had a project to gain 3-star status. This had been denied the previous couple because the old system insisted on a lift/elevator as a pre-requisite for 3-star status. So how was 3-star status gained in real terms? By investing in new bedding [but not beds] and re-decorating some of the rooms. I say some, because those not re-decorated are given to Hotel.com bookings – which is the case with most cheaper deals in hotels using such portals! So what did our first customer think who had stayed in the same hotel under both ownership regimes? Far from impressed with the 3-star offer – inferior service and welcome and the decor decidely un-Provençal! It is early days but, 6 months on, the hotel has dropped to second place in the TripAdvisor rankings. Then let’s move onto Causse et Cevennes, recently crowned as a UNESCO World Heritage Site. The town in question has two hotels belonging to the same marketing group, both of which have been upgraded from 2 to 3-star by the State, but remain graded as the equivalent of ‘2-star’ by their own group. We received a mailing from one of the hotels informing us of their newly-gained, 3-star status and their new spar and fitness centre facility. When asked whether the non-spa-frequenting customer [pleasantly fatigued hiker?] would notice any difference in terms of extra comfort in their bedroom, our enquiry went [and remains] unanswered – although recent photos reveal that they have…surprise, surprise, changed the duvet covers! There you have it in a nutshell as far as walkers’ accommodation in France is concerned: is the countryside inn competing with the big city for the same customers? If you are fully booked in season with customers who walk to and from your premises, are you going to pay for stars that might bring the odd customer by car off season? Other interesting stories relating to the classification changes will be added here in the future and we would love to hear your own experiences of accommodation you have stayed in, both pre and post the new classification system. In conclusion, however, suffice it to say that knowing one’s accommodation suppliers intimately is now more important than ever! See The Sydney Morning Herald’s endorsement of The Enlightened Traveller. See the Forbes Traveler endorsement of The Enlightened Traveller. See a Top Contributor to Tripadvisor’s endorsement of The Enlightened Traveller.